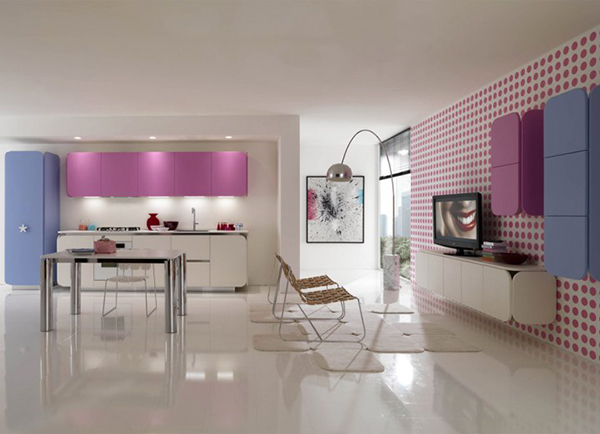 Euromobil’s new IT-IS kitchen furniture line embodies the urban kitchen for the modern home. Made in Italy, the kitchens come in different colors and configurations to suit any scheme from the playful to the elegant or even sharp. The look is quite unique and very urban. What they all have in common are confident, flowing lines, exquisitely rounded corners finely crafted details and state of the art technologies. (however, I’m a bit worried about cleaning those rounded parts…) The drawer fronts have an oblique edge for easy grip, patented by Euromobil themselves. They are built functionally and strongly and they look amazing. What a joy it would be to work in such a kitchen. Learn more at Euromobil. Yellow might be an unusual color for a kitchen, but if you want something punchy and vibrant, there are few other colors that stand out like it. Below are just a few examples for your inspiration. Italian kitchen manufacturer Snaidero has recently released their striking new kitchen concept Venus that will give your kitchen a bold, modern look. 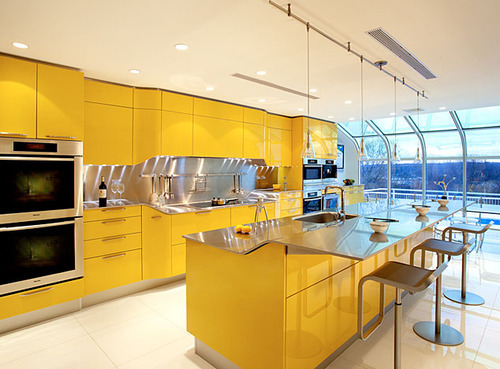 Based on the Yellow Venus installation in Long Island, this kitchen offers several vibrant hues that are very alive and eye catching.